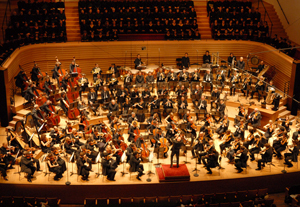 Founded in 1967, the Orchestre de Paris grew out of the renowned Société des Concerts du Conservatoire, the oldest symphonic ensemble in France, which was established in 1828 by François Habeneck, who was the first exponent of Beethoven's symphonies in France. Charles Munch was the first Music Director of the Orchestre de Paris (1967-68). He was succeeded by Herbert von Karajan (1969-1971), Sir Georg Solti (1972-1975), Daniel Barenboim (1975-1989), who founded the Orchestre de Paris Chorus, Semyon Bychkov (1989-1998), Christoph von Dohnányi (1998-1999), who acted as Artistic Advisor, and Christoph Eschenbach (2000-2010). In September 2010, Paavo Järvi became the new Music Director of the Orchestre de Paris. The orchestra has performed under the direction of famous conductors, such as Abbado, Ozawa, Bernstein, Boulez, Kubelik, Giulini, Celibidache, Böhm, Haitink, Mehta, Maazel, Salonen and Gergiev and has accompanied the greatest soloists. Its repertoire covers three centuries of music, and in a variety of forms from symphonies to opera. Special attention has been given to living composers with commissions and premières of works by Gilbert Amy, Luciano Berio, Pierre Boulez, Franco Donatoni, Pascal Dusapin, Henri Dutilleux, Jean-Louis Florentz, György Ligeti, Witold Lutoslawski, Matthias Pintscher, Eric Tanguy, Iannis Xenakis and Marc-André Dalbavie, to name only a few. As an international ambassador of French music and culture, the Orchestre de Paris has undertaken numerous successful tours throughout the world and performed at prestigious festivals such as Salzburg, Aix-en-Provence and the BBC Proms. The Orchestre de Paris has a discography that reflects its commitment both to the traditional symphonic repertoire and to contemporary music. Many recordings have received major awards.